The Ecological Angler - Spawning Coho in a Hatchery. 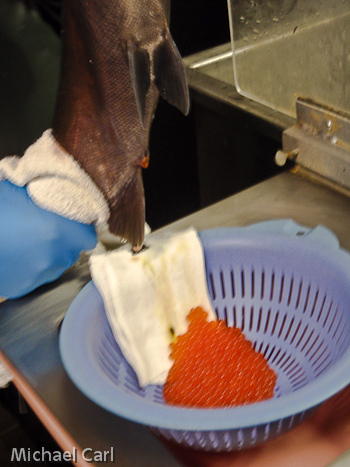 The Warm Springs hatchery performs a dry fertilization of the coho eggs. Briefly, dry fertilization entails collecting the eggs and sperm in separate containers without water or ovarian fluid present. Next, hatchery staff mix the the eggs and sperm together, and then water is added to activate the milt which starts the fertilization of the eggs. 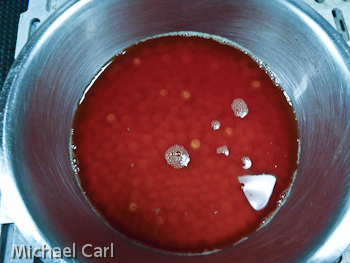 Eggs from ripe females get hand stripped into a sterilized colander to allow the ovarian fluid to drain off. (The middle picture - to the right.) Milt from each of the four males to be spawned with each female get expressed into individually labeled paper cups. (The top picture - to the right.) The motility of each male's sperm is checked under a microscope. If less than half the sperm were actively swimming or the sperm appeared lethargic, it's discarded and another male selected from the spawning matrix. The eggs from each female were divided into two lots of approximately equal numbers and each lot was then fertilized by milt from two males by putting the milt directly onto the eggs, then covering them with just enough stream water to activate the sperm and allow fertilization to occur. 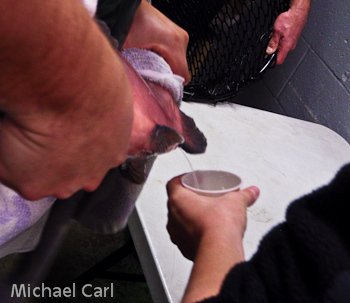 After fertilization, the eggs get "water hardened" for three minutes and rinsed of excess milt. Unfertilized eggs are removed, and the fertilized eggs put into a 100 ppm iodine bath to kill any bacteria on the eggs The fertilized eggs are then rinsed by passing clean water into the container. Finally the eggs are put into small trays and placed into a special moisture controlled box the size of a large refrig where they get incubated until the eyed egg stage. Each female's brood is reared separately to allow the hatchery staff to track the hatching success from each female.